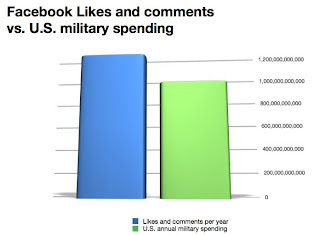 Humans will make 1,168,000,000,000 “Likes” and comments on Facebook in 2012. 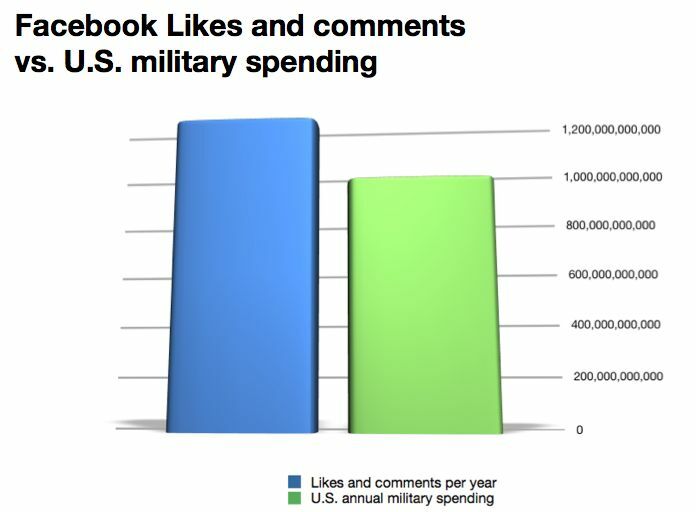 That’s an almost unfathomable number, so we can put it in perspective in several ways — if each Like and comment were one dollar, that’s slightly more than U.S. annual military spending ($929 billion); it’s 3.2 billion per day; it’s 1,296 per year per Facebook user; or, to bring it all the way home, the average Facebook user makes 3.5 Likes or comments each day. Since the average Facebook user also is connected to 234 friends, and you see what your friends do, this means if you’re on Facebook you are exposed to 819 “Likes” or comments each day. 819 Likes and comments per day is a lot. Now, to be fair, Facebook doesn’t break out “Likes” and comments separately, and to parse only the “Likes” that brands are now so enamored with is difficult. Facebook is a chatty medium, so if we assume charitably that 90% of activity on the network is comments, that’s still about 82 Likes per day that you would see. 82 Likes is a lot, too. All this means is “Likes” have become a commodity — and they face the same challenge that advertising “impressions” have for decades. There are more coming your way than you know how to respond to. This is not a mathematical nuance, but a real problem for marketers who hope to scale organically inside social media without paying for it, because the old challenges of communication really have not changed — there is more supply of messages being pushed out than there is demand for consumers willing to receive them. I’ve written elsewhere that the desire to “go viral” inside social networks faces tremendous friction that precludes success. The formula for going viral — Viral spread = (Message generation rate – Absorption rate) * Cycle time — means if more people “absorb,” or refuse to pass along, the message than the number of people who share it, your meme will die. Like a story passed from person to person at a party, if your message is deemed boring, the conversation will flow somewhere else. The problem social media faces is really that its rapid adoption by users, who spend hours a day sharing on Facebook and Twitter, has created a growing glut of messages. Like email or TV spots or radio ads, there are more people braying at you than you choose to listen to. The supply of marketers chasing the demand of consumers has always been out of whack. Facebook “Likes” now face exactly the same challenge that other forms of outbound communications do, too. All of this explains why advertising expenditures in the U.S., especially among digital advertising, continue to grow. The dream of consumers organically listening to your pleas for engagement is a nice one. The trouble is, you need to get in line for organic growth, so it may be easier to just pay for it. 819 Facebook Likes & comments per day + 3K–6K ads per day + x-number tweets, texts & emails per day = punch drunk consumers? Hal, we have reached an insane cacophony. Future generations will look back and think we are nuts. Wow, really? Likes have turned into the new thing for advertising and living. Hey Ben, could you please share where you got the 1,168,000,000,000 number from?